When you think of lasers, what comes to mind? Perhaps a blaster bolt from Star Wars, or perhaps the moon laser from Austin Powers? In reality, though, lasers aren’t quite so spectacular, but what if you could shoot lasers from your eyes, or have a laser pointer in your finger tip? Maybe someday you can: According to the Economist (reporting on a paper published in the journal Nature Photonics), a research team from Harvard Medical have engineered a cell that will emit a laser. In general, lasers utilize two distinct systems. The first is a system that will direct the energy or external light; the second is a system of mirrors that collect the energy until it builds to a specific power. This creates some unique hurdles in the quest to create a biological laser. To build a laser, you have to create something that emits energy. 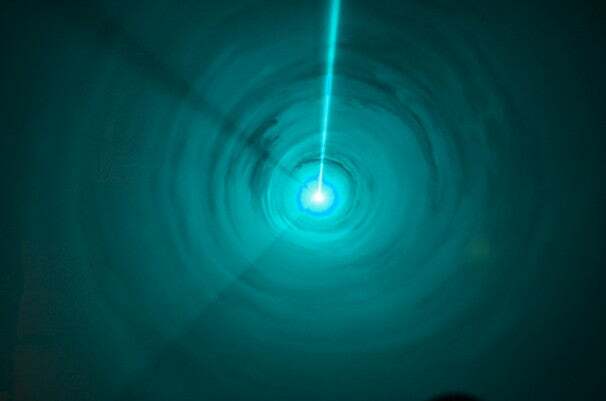 Normally, a laser uses a gas mixture or crystals coated with rare-earth compounds. Inside a cell, however, neither of these can exist in a quantity large enough to gather and direct light. To get around this, Seok-Hyun Yun, the leader of the team that created the cells, decided to have the cell create its own light. The team used a compound known as green fluorescent protein (GFP) as an energy collector instead. GFP is a fairly well known chemical compound and is used by biologists to track specific genes within cells. It is also what makes certain jellyfish glow in the dark. At this point, Dr. Yun's team had a human embryonic kidney cell that could harness and redirect light, but they still couldn't amplify the light into a visible laser. To gather the light to achieve proper power, the scientists used two incredibly tiny mirrors. These mirrors were placed at just 0.2mm apart from each other to gather the laser light emitted by the cell. After pulsing light at the cell, it produced a green laser--one bbright enough to be scene with the naked eye. This does beg the question though: What exactly are the practical aspects of having a cell generate a laser? It looks impressive enough but will it actually accomplish something? And those are both difficult questions to answer. As of yet, there is no practical application, and the mirror system needs to be placed within the cell first, which Yun wholly intends to do. However, the doctor theorizes that the laser could be implemented in such a way as to help with corrective laser surgery or remove tattoos. Perhaps the laser will be little more than a fancy way to give corporate presentations, perhaps people will be able to cut steel with their eyeballs. Or maybe Dr. Yun's team should get in touch with the person behind the BLAZE project. It is hard to say with the technology used to produce the biological laser still in the early stages of infancy, but we can always hope for laser vision.